Height is approx 12"-24". 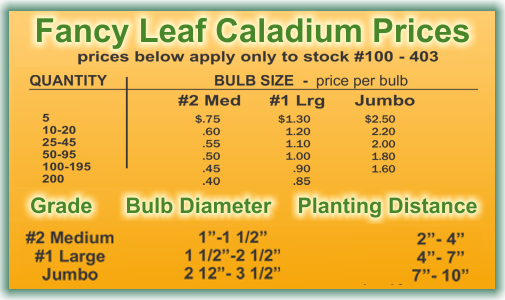 Leaf size is Medium-Large. Will tolerate full sun. White Queen, the name says it all. Queen, because there are none that compare to her striking centered red vein. Please feel free to curtsey as you pass her in the garden. Like any other royal monarch she loves to display her majesty for all to see. Bright, sunny locations are just fine with her as they allow all to view her in full splendor. While White Queen caladiums may have a sturdy constitution when it comes to sunlight, she can be quite fickle when it comes to her roots. 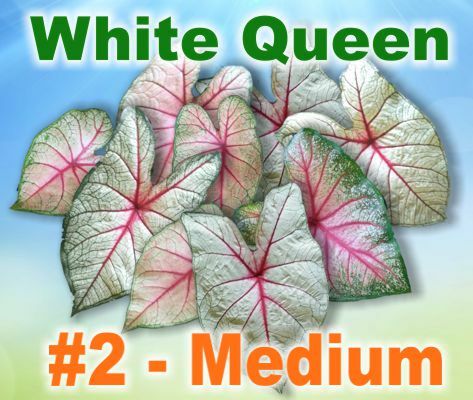 Acidic soil, like you find under oak trees, will turn White Queen into a common pink peasant caladium. The same fall from grace could just as easily happen with too much fertilizer or Miracle Grow, so use sparingly with the Queen if you must use at all. So unique is White Queen, that we don't even compare her to other white caladiums. A close cousin though, is Scarlet Pimpernell. The juxtaposition of the names certainly alludes to the contrasting background colors of these caladiums cousins. Should you want something entirely different please feel free to peruse our Availability Page to see a small glimpse of every variety of caladium that we sell. Similar varieties can be accessed from the links below.